Another day, another music video for Justin Bieber but even this one proved difficult for the biebs. 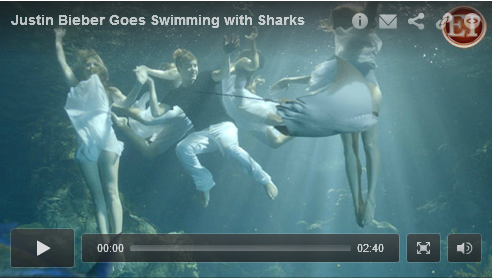 The 18-year-old had to swim with sharks in his latest video. The singer struggled to plunge into a water tank filled with bonnethead and zebra sharks because he's scared of the creatures. "I`m terrified of sharks," Justin told ET Online. "I was so scared. I hate sharks. It took, like, an hour for me to even jump in the water." Fortunately there were female dancers on hand to help. "Being with the ladies under there kind of made it a lot better," the superstar added. The footage shows Justin surrounded by sychronised swimmers called the Aqualillies and will be shown during the shows on his Believe tour. Justin's director Jon Chu, is the one to blame for the dangerous stunt as he is the one who came up with the idea for the video but the biebs didn't let him off that easily. "He was pretty scared, which was awesome. I had to jump in with him to make sure he knew it was safe and he wasn't going to get bitten," said Jon, who also directed Justin's concert documentary film Never Say Never. Maybe next time he should just stick with singing to Selena look-a-likes instead.